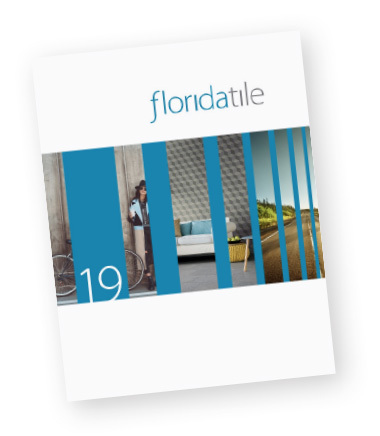 The classic definition of Mingle, comes in a line from Florida Tile. MingleHDP abandons the conventional concept of what a stone installation needs to look like. We have re-imagined and repurposed the tradition. By dissecting the classic looks of Travertine, Marble and Limestone down to their basic graphical properties, there were elements that, regardless of the pattern, could all work together. We were then able to piece them back together to create a cohesive look that both blends in and stands out at the same time. What we achieved is a concept that uses a combination of multiple stone graphics in the same color. Working with a strong Travertine and Breccia Marble, along with a more subdued Limestone, we intricately paired them together in the same tone to create a single color. Conceptualized as a 4 color line, we decided to make 2 colors mixing the graphics, an ivory-Warm Winter Mix and a grey-Cool Summer Mix. The other two colors, is a bluish grey-Dry Stream that is created using only the Travertine graphics, and a warm beige tone-Soft Rock created using only the Breccia Marble graphic. With the exception of select trim and decorative pieces, this product line is Made in the USA of 40% pre-consumer recycled content, is GREENGUARD® and Porcelain Tile Certified.